I love TileCache ! We have created billions of tiles with it (http://map.geo.admin.ch/,http://plan.epfl.ch/, http://map.veloland.ch/, http://coppet.geocommunes.ch/ etc, etc...). The only issue with TileCache is that it's not an official standard. The OGC has just released, on 2010.04.06, the first version of the WMTS (Web Map Tile Service) implementation standard. And the very good thing is that one part of the standard proposes a RESTFul implementation. I can already hear some comments like 'all this time for that', but now that it exists, it's probably a good idea to use it. I still think that the service oriented architecture (KVP and more fantastic SOAP (have a look at the wmts:BinaryContent XML tag...)) is a non sense, so this article will only focus on the resource oriented architecture. The standard contains a nice sentence: "The RESTful pattern provides the ability to set up conformant WMTS servers simply", so let's have a look if it's possible to use a TileCache tile sets and serve it as RESTFull WMTS . The notion of layer is the same in TileCache and WMTS. The notion of Tile Matrix Set doesn't exist in TileCache. A Tile Matrix Set is a collection of tile matrices defined at different scales. 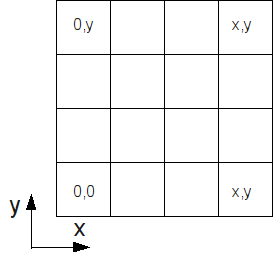 For one layer, you can define several Tile Matrix Sets, typically if you want to create tiles in various coordinate systems. A tile matrix is a collection of tiles for a fixed scale. The tile organization is not the same in TileCache and in WMTS. In WMTS, the style has been defined as mandatory. Not very clever from my point of view. This should be an optional value. But let's add "default" everywhere... And I still don't understand why the style is defined on the layer level. Thanks for this straighforward and clear explanation. One question : I tried to find if the WMTS specification offers a way for the client to ask for different WMTS ressources with different tile spaces(thus with same scale sets and same CRS of course). i.e. : a client would like to ask tiles through WMTS interfaces to two differents WMTS servers with differents tile spaces. Is it possible ? This is a problem right now with Tilecache which leads to limited interoperability. 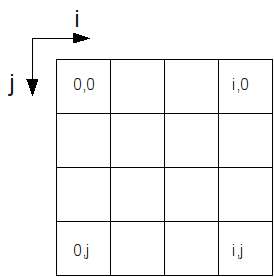 If I interpret it correctly, you would like to use in a viewer two tile matrix sets with various tile size and extent. Usually, for simplicity reasons, when we use TileCache, we try to have the same tile size (256x256 pixels) and the same max extent for all tiled layers. But, after looking at the OpenLayers code, this should be possible to define, per layer, a specific tile size and a specific extent. So this means that the only constraints on the client side are the resolutions and the coordinate system. Tile size and extent can be chosen freely. Regarding performance issues, it is certainly better to use same tile size and extents on client side. But good to know that is is possible.